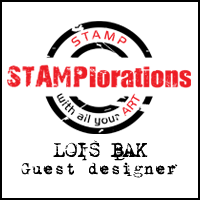 Vicki Ducher is the newest member of the Stampin'Bs, and her first challenge really made me think. It was a color challenge -- Brown, Kraft, and Purple -- not my best color combination. But I dove right in! I finally decided the lilies would look good in purple; so after stamping them in brown, I sponged on two shades of plum and cut them out. My 4 ¾ inch square card base is Deepest Mahogany, the “kraft” layer is Desert Sand, and the DP is from a Basic Grey Wisteria paper pad. I made the kraft layer a little wider so that I could add the doodles around the edge. 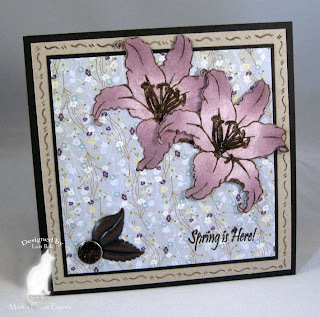 Both the lilies and the sentiment are from the Spring and Easter 2010 set from Mark’s Finest Papers: Speedy the Cat Collection. I added a big jeweled brad to the brass leaves for some interest in the corner. All supplies (except the plum inks) are available at Mark’s Finest Papers. 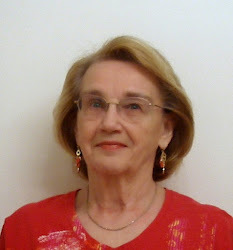 Vicky Gould was the hostess this week for the Stampin'B's DT Challenge. She wanted us to do a Split Negative card, which I love doing. It’s one of my favorite techniques, but I must admit I don’t do it too often. 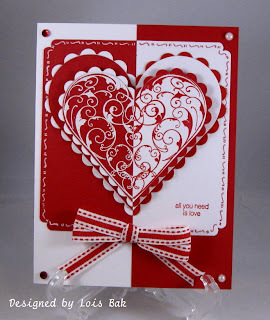 I used Flourishes’ Lace Heart stamped on both red and white, cutting out the hearts with the Nestabilities Heart die, and then cutting each one in half. I matched up the opposite sides, taped them together on the back, and layered three times. After putting the hearts on the background paper, it looked a little stark, so I added the doodling around the edge with a white gel pen and a red glitter pen. I figure I could use this as either a Valentine or an Anniversary card, so I used a generic sentiment. Then I added the pearls, rhinestones and ribbon. Thanks for a great challenge, Vicky! Anne (itsapassion) filled in for Stef for today's SCS Inspiration Challenge, bringing us a great Etsy website. There were a lot of different birds -- and other things from nature -- from which to choose. 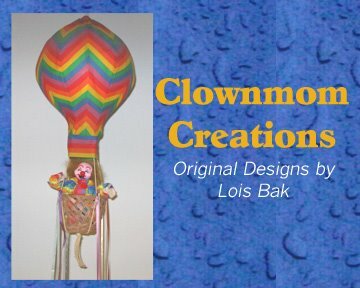 I made two cards this morning. As I was looking through the Etsy store, I came across this Snowy Owl print at 1:00 am and knew immediately what I wanted to do. I stamped Inkadinkadoo's owl in Tempting Turquoise and cut it out with a Labels Nine Nestabilities die, sponging around the edges before removing the die. I didn't want to take away from the owl with too many embellishments, so I just matted in black and added some ribbon. I came back this morning to find something else to use for inspiration. Many of the prints on the site used birds and postcards, so my card was drawn from several of them, Bird No. 32 in particular. I used Copic markers on the bird and the fern, and sponged the butterfly and the postage stamps. The Inspiration Challenge is my favorite of the week because there are so many directions to take from the original point. Today is the final day of Mark’s Finest Papers February Blog Hop, celebrating our BRAND NEW STAMPS for the Speedy the Cat Designer Collection and Serenity Collection! They are available TODAY! For your chance to win BLOG CANDY, visit and comment on each of the design team members' blogs on February 10th, 11th, and 12th. Tomorrow (February 13th) a winner will be chosen from those who have visited all 9 blogs all three days. 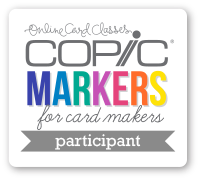 You still have time to go back and comment on the first two days’ cards.The winner will be announced on the Mark's Finest Papers Blog and will receive 2 Stamp Sets that will be released NEXT month. And remember, Friday night will be the New Flourishes Release at Mark's Finest Papers! My card today features the Serenity Collection set: Thoughts of Joy. 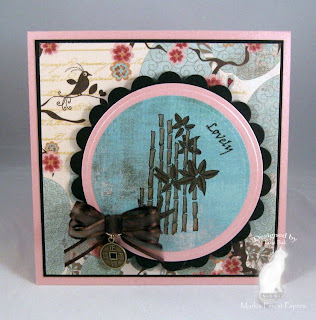 The images are oriental in nature, and I thought this DP from Basic Grey’s Blush Paper Pad had some oriental feel to it. The card base and middle round layer are Mark’s Finest Papers’ Pink Freeze Sparkle. It’s hard to see, but IRL there is a wonderful shimmer to it. The bamboo image is stamped with Palette Burnt Umber, embossed with clear embossing powder, and colored with Copic markers. I added a bow and an oriental coin charm to finish it off. 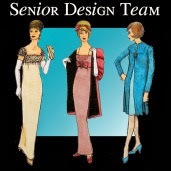 Be sure to visit the rest of the Design Team blogs and comment on each for your chance to win. 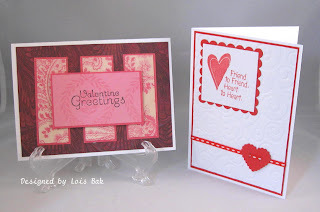 I am the hostess for this week’s Stampin’Bs challenge; and, in honor of Presidents Day, I wanted the team to make a card using red, white, and blue – BUT not to make a patriotic card. 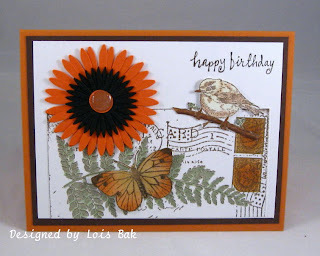 I combined the Stampin’Bs challenge with Day Two of the Mark’s Finest Papers Bog Hop. 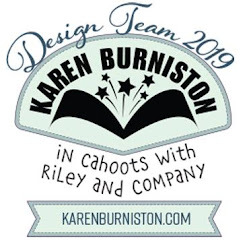 Mark's Finest Papers Design Team is celebrating our BRAND NEW STAMPS for the Speedy the Cat Designer Collection and Serenity Collection with a Blog Hop! They are available TODAY! For your chance to win BLOG CANDY, visit and comment on each of the design team members' blogs on February 10th, 11th, and 12th. On Saturday, (February 13th), a winner will be chosen from those who have visited all 9 blogs all three days. The winner will be announced on the Mark's Finest Papers Blog and will receive 2 Stamp Sets that will be released NEXT month. And remember, Friday night will be the New Flourishes Release at Mark's Finest Papers! I’m not a cat owner, so I really don’t know if this sentiment is true. But I’ve been told that it is definitely true! I had always thought Siamese cats were tan, but I did a little research and found that they can, indeed, be white – which meant I could safely (read: legally) use this cat – from the Speedy the Cat Collection: Speedy the Cat’s Friends -- for my red, white, and blue challenge. After stamping the image, I tried to do the “outside the box” cutting, which worked as far as it went; but I had trouble with the sponging. So I just stamped it twice; cut one out and then glued it over the one on the rectangle. There are three eyelets on the cat panel, but two of them are hidden by the bow. All materials are available at Mark’s Finest Papers. 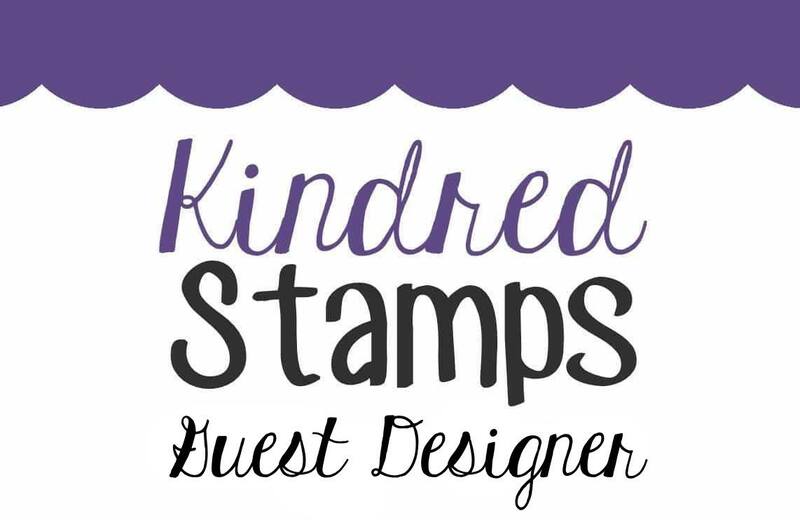 Mark's Finest Papers Design Team is celebrating our BRAND NEW STAMPS for the Speedy the Cat Designer Collection and Serenity Collection with a Blog Hop! They are available at Mark’s Finest Papers TODAY! For your chance to win BLOG CANDY, visit and comment on each of the design team members' blogs on February 10th, 11th, and 12th. On Saturday, (February 13th), a winner will be chosen from those who have visited all 9 blogs all three days. The winner will be announced on the Mark's Finest Papers Blog and will receive 2 Stamp Sets that will be released NEXT month. And remember, Friday night will be the New Flourishes Release at Mark's Finest Papers! 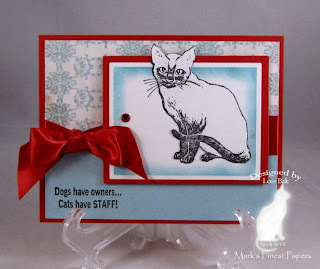 This card features the Speedy the Cat Collection: Spring and Easter 2010. 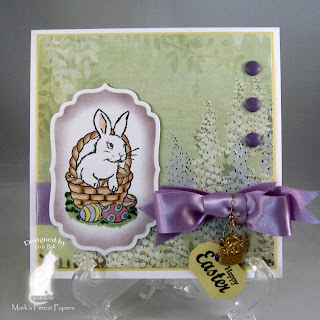 I stamped the cute little Easter bunny on Snow Storm Smooth, cut him out with a Spellbinders Labels Four die, colored him with Copic markers and sponged around the outside with some purple ink. The background designer paper is from Basic Grey Wisteria Paper Pad, matted on Lemon Slice cardstock. I added some ribbon, an Easter basket charm, and the sentiment – stamped on Lemon Slice and cut out using the small Labels Four die. Be sure to visit the blogs of the rest of the design team, commenting on each, to be in the running to receive the two stamps sets from next month. In honor of the month of February, the Crazy4Challenges challenge this week was to make a Valentine's Day card. As it so happens, my sister and I are in the midst of a project to make 90 Valentine's Day cards for the residents of the assisted living facility where my mom lives. So it was not hard to have an entry in this week's challenge. To make this project not quite as daunting as it may first appear, I actually made six cards of each design that I made. These two cards feature stamps from SU's Grateful Greetings set. The one on the left also has a Michael's $1 stamp, colored with Copics, and a border using a Martha Stewart border punch. The hearts on the one on the right are from the Cuttlebug Concentric Heart die. The paper on this card is white mulberry paper with red hearts scattered throughout. The papers on the card on the left are from a pad of really pretty paper I bought last year -- K & Company's Smitten Specialty Paper Pad. Martha Stewart's heart button punch worked well with the thin ribbon on the card on the right. My sister called me this morning. She is finished with her 45 cards and is putting them in the mail for me today. I was a little late in starting (yesterday), and so far I have 36 cards finished. There is a light at the end of the tunnel. I have only nine more to go! Here are a couple more cards I did for the Flourishes Timeless Tuesday Anniversary Challenge. 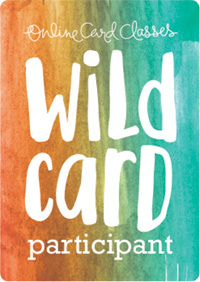 The first one, hosted by Dee Jackson, was to be a "fruity" card. 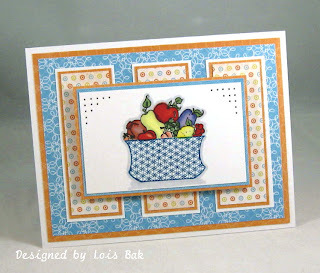 I chose the fruit basket from Mixed Greetings, combining it with some designer paper from the DCWV pad called, appropriately enough, Citrus. My second card was Betty Wright's "cut out and pop up" challenge. 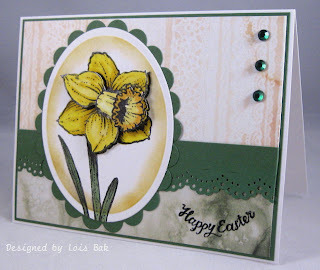 I actually stamped the daffodil three times, cutting various parts of it and popping them up with dimensionals. All of the challenges for the anniversary were re-visited challenges from throughout the year. It was fun going back and doing them over again. Tomorrow is my niece and her husband’s wedding anniversary, so I used today’s Stampin’B challenge to make an anniversary card for them. NancyRuth wanted us to make a wiper card – which I’ve done only once before -- so I had to look up the SCS tutorial to refresh my memory. 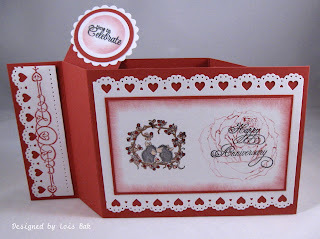 I think this little House Mouse stamp is so very cute and perfect for an anniversary. You can’t really get a whole lot on a wiper card, so I just used a Flourishes’ rose, stamped off once, to balance out the HM image and stamped the Happy Anniversary sentiment over top of the rose. I found an appropriate small sentiment to put on the wiper part in a set of Scent with Love Label Accents stamps. The flourish down the side is from Inkadinkadoo. Fortunately, I had bought this Martha Stewart heart border punch not too long ago. NancyRuth, you stretched my designing skills, but I think the card turned out okay. Thanks for the push! Flourishes Timeless Tuesday is celebrating its first anniversary with six different challenges -- remakes of previous challenges. I'm going to try to do all six challenges, and here are my first two cards. Maki Jones wanted us to make a card using our favorite Flourishes set. 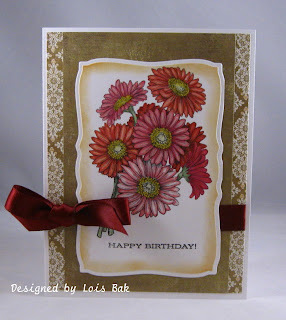 I actually chose two for this card -- Gerbera Daisies and Sweet Violets. I stamped the daisies with Palette Noir Black and colored them with Copic markers. After cutting out the piece with a Mega Curved Rectangle nestie, I sponged around the edge with Palette Cognac before removing the die. I like how this gives the illusion of another layer without adding the weight. The background DP is from Basic Grey's Sugared paper pack. Silke Ledlow was the hostess for the second challenge -- to make a card using pink as the main color. Pink is not necessarily my "go-to" color, but I figured Valentine's Day would be a good place to use pink. 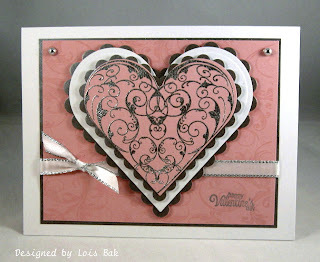 I stamped and embossed the Lace Heart in silver, then cut three more hearts using my Nestabilities Heart dies. 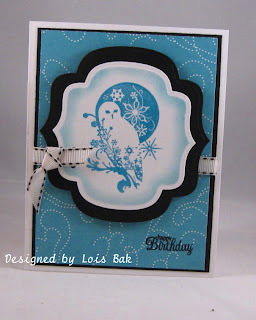 The background piece is Flourishes Damask stamped with Versamark. The sentiment is from a Scent With Love set called Label Accents. I liked the wider white "frame." Okay, I have two of the challenges done -- four more to go!